Commonly used in the Victorian home, this third hand clamps to a table while the beak holds the fabric to be sewn. Depressing the tail releases the beak enabling the fabric to be repositioned or removed. Before the invention of the sewing machine, clothing, sheets, and other household items were sewn by hand, this handy little clamp was often used for hemming. Early clamps can be traced to the late 17th century. 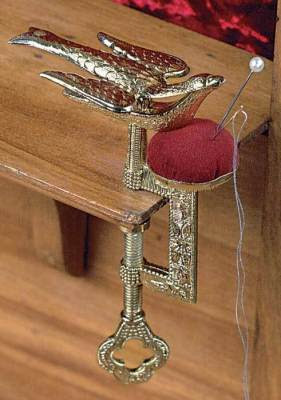 The "sewing bird" came into fashion early in the 18th century. Invented in the Georgian period in England, it was the first device that allowed the material to be moved without having to loosen the clamp. Many were made for the travel trade and were used for advertisements. Most were made of polished and turned wood or iron. 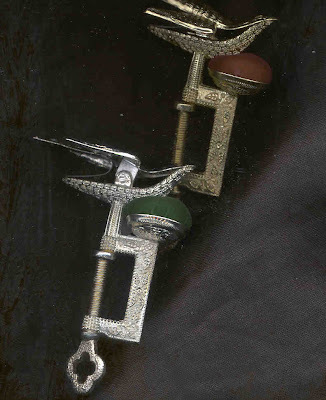 Victorian clamps were made of brass, iron, steel and painted wood. In America the first sewing birds were called "grippers." Not used widely until mid-19th century, they became popular as a luxury item, which a young man would present to his intended bride months before the wedding. These were made in many varieties; birds with or without a pin cushion, on a spindle or not, deer, dogs, fish, frogs, snakes, dolphins, cherubs and people. Small thread winders, spool holders, netting hooks and rug braiders were also common. After the invention of the sewing machine the need for grippers was diminished but they were still manufactured as novelties. The Singer Sewing Machine Company produced a few as late as 1980. These original inexpensive novelties of yesteryear are expensive antique collectibles today. I have seen these marvels in antique stores but don't actually own one, however, I had a need for making my own version of a "sewing bird". I found myself frustrated at always have to run to my sewing basket while crafting when I needed a handy pin, needle, or thread. Here is my new sewing bird sitting on the worktable and all ready for service with no more running to the sewing basket! They say that necessity is the mother of invention. I truly believe that and I am very happy with how my little version of a handy and helpful "sewing bird" turned out. "Sew", if you could create a needful invention to solve one of your problems, what would it be? Well, Miss Sandy, aren't you just the most clever smarty-pants! That is so cute! I sure didn't know what those were - I learned something new today! Thanks! This was so very interesting and I love your little bird Miss Sandy. Always a joy to visit with you. Your interpretation of the sewing bird is just perfect! I have heard of them, but have never seen any. Now I will be on the hunt for one, hoping to find a good deal! I love vintage sewing items. Thanks for the little history lesson on them and for sharing how you made your sweet bird! Your little birdie is so cute! Makes me want to make one! Miss Sandy, that is the sweetest little thing :) I love the curly-cues on the wings! Sandy, it's so sweet! Very inventive of you! It seems that birds were the favorite icon of choice for many domestic chores. Have you ever seen "pie birds"? Those were ceramic and hollow and the beak was open to allow steam to exit a pie after being baked. I wonder why they would need it to exit the pie? Maybe it made the top crust soggy if it didn't exit? I have no idea. Being "allergic" to the kitchen and any chores resembling COOKING...I don't have a clue! LOL! Actually, I do like to bake and pies are one of my favorites, as well as cookies. I make a fine pie crust, flaky and tender and my girls beg for my apple pie. But I have no idea why I would need a pie bird. LOL! I never knew about these and I've been sewing for years. Boy do I feel silly. Yours turned out wonderful! I've never heart of a 'sewing bird' either. But, after seeing your gorgeous creation, now think every needleworker should have one!! I love the scroll-work embroidery and his little nest too, everything about him really.... so inspirational! I need a little clamp for my mouth, but that's another story entirely. That creation is just darling as all your creations are. What a good idea and thanks, too, for the history lesson. I can't recall ever hearing about such a little bird nor do I remember ever seeing one. Now that I know what I'm seeing, perhaps I'll be able to identify it. So I'm totally impressed, and amazed, and completely in love with your little birdie. Such a great idea to make it out of cloth, and the stitching, simply divine. Thanks for sharing your how-to! Oh Sandy, I love your info about the little sewing bird. I had never heard of one, but I love all of them. The one you made is so sweet. I would like to have one that holds the fabric when I am taking lace off of used clothing. That is when I really need that third hand. Thank you for this wonderful blog today. I loved it. What a wonderful handy little bird you made! I could use one of those too! As for the pie bird that Diane mentioned... it is so the steam can escape but I think it is so the bottom crust won't be soggy but nice and flaky as the top crust. I'm pretty sure that's what I've heard. Now we just poke holes in the bottom crust with fork tines. The pie birds are pretty darn cute though. Sandy , how delightful -- beautiful and also usefull . you almost made me want to sew! Love it! !Love it!!! Love it!!! How clever! I am just marveling over this, as just today I myself had to go run to my sewing basket while I was papercrafting! I was thinking, I have so many pincushions, so many needles, etc. - why don't I just keep this with my papercrafts? You are always one step ahead of me, it seems! Your little bird is darling...my friend would like someone to invent a sewing machine that would use a spool of thread instead of winding a bobbin...I agree! Miss Sandy...I learned something so special from your post. I never knew about the sewing Bird...I even went and looked at the ones for sale, they are not "Cheep!" This was a lovely post and I really like your Birdie! I am sorry that I cannot help you with your question about blogger. I am a Mac user and that might explain why I didn't have the problem, nor did I try to put up a new post today. Wishing you luck, I know how frustrated one can get when things just don't work as they should be, too annoying. But now for the good part; I never heard of a sewing bird, which seems to be an omision anyway. Your sewing bird is a great addition to those already excisting. It is beautifully made and so clever and through your tutorial anyone could have one's own sewing bird, thank you! Again (I don't want to sound like a sing song) I think this is something for a Somerset publication! I think you should listen to Dawn too and don't be too modest! You could send in some photos or perhaps your blog could be featured there! I didn't have a chance to thank you for your sweet Valentine's wishes. We had a day with almost all my relatives on my mothers side. Just eating, chatting and having fun. That is my way of having a good time. Hope you had a lovely day too. love your little sewing bird! I would love to start a collection of sewing birds, but they are so expensive! Oh Sandy! You'll never guess how I came upon this post of yours. 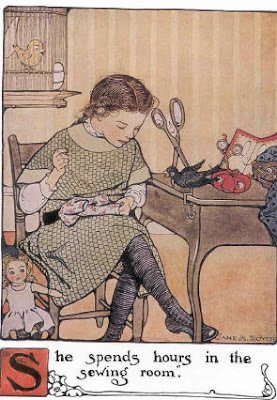 Today I went to the flea market at lunch and I found an original copy of "Easy Steps In Sewing for Big and Little girls" -that first image you showed is from this book. It was the clamp bird that caught my eye in this book and I went looking for them online because I had never heard of them and because I have a thing for birds. I simply must have one now. But I ADORE the one you made and am now inspired to see what I can create. I hope you are having a wonderful day! Hugs!